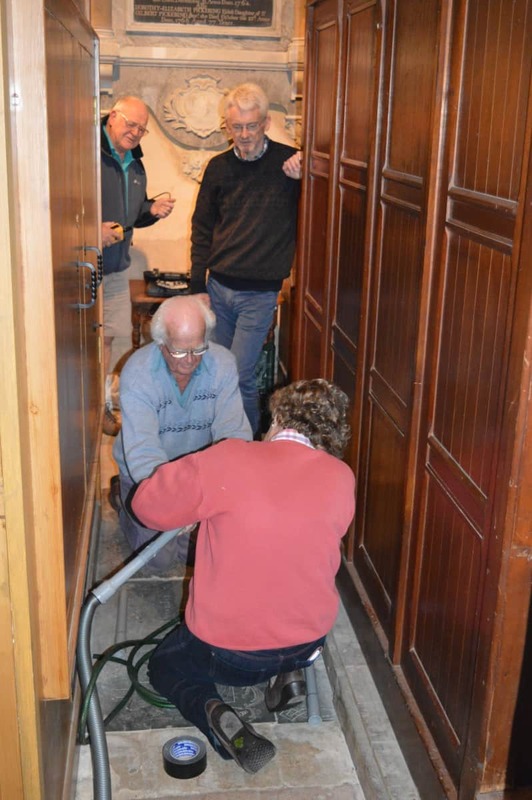 Just over a year ago, Clive posted an item on his research into the possible siting of a vault under an area of the chancel which he thought might contain the bodies of members of the Pickering family. He had concluded that there was sufficient written evidence to justify a search for the vault. A major difficulty is that the most likely location of the vault is beneath the plinth on which now stands the church organ, an exceedingly difficult place to access given the size of the plinth, 5.2m x 2.7m but only 10cm high. The problems notwithstanding, it presented an unusual – but tantalising – challenge which we thought might be solved using a camera probe. 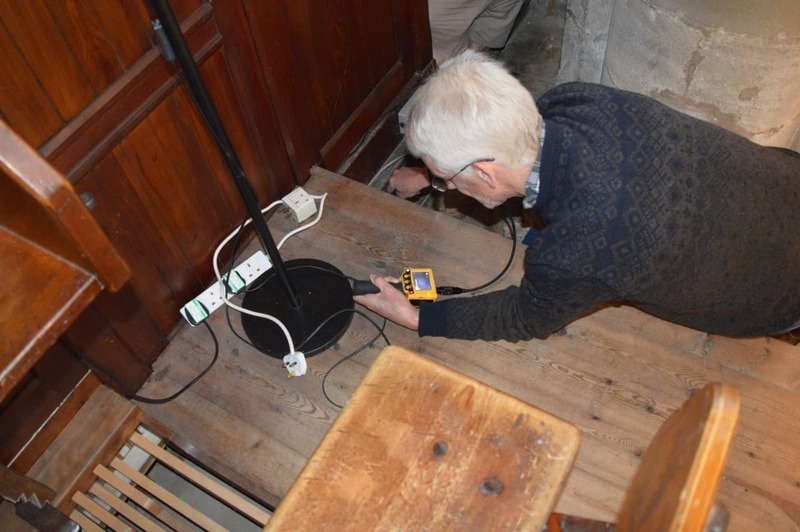 In October, using one such camera and calling on the expertise of its owner Paul Ollett, Clive inserted the probe through one of the existing ventilation holes in the sides of the plinth and revealed … 148 years of dust and debris covering the floor! Sylvia and Terry hastily set up a Heath-Robinson-type rig to effect some cleaning and, as a result, it was possible to make out a small area of lettering, disappointing in its extent but sufficient to warrant further exploration. Undaunted the team is anxious to undertake further searches and remains optimistic about solving this intriguing mystery. So watch this space as we progress further. It may not be on the same scale as Tutankhamun but it is no less fascinating.